Luxury gaming manufacturer and electronic table game (ETG) market leader Interblock® announced today that it will exhibit its Stadium, StarBar, MiniStar, eTable, Big Six and Roulette Diamond Station product lines at the Global Gaming Expo Asia at the Venetian Macau, May 15 – 17. The company will be on stand #513. Interblock’s Stadiums can be configured with automated, video, dealer assist generators and/or live table platforms based on footprint availability. This flexible platform provides operators with the most efficient use of floor space when multiple games are activate. It offers the most versatile Stadium game portfolio to generate play 24/7 while reducing operating expenses. At the show, the Stadium will be configured automated and video versions of Roulette, Multi-hand Blackjack, Baccarat and Sic Bo. Additionally, Interblock’s eTable will be configured for Baccarat – including side bets – with five seats and allows operators to simply press a button to change the game to play with or without a live dealer. If the operator chooses to have a dealer, the dealer presses a button to initiate and confirm the game. This option gives operators the flexibility to generate revenue with or without a dealer. The eTable can also support Blackjack. The Roulette Diamond Station gives operators the opportunity to offer Roulette to venues that cannot place ETGs or live table games, due to space or jurisdictional requirements. The Roulette Diamond Station’s small footprint allows the product to fit perfectly into venues with space limitations. Game cycles can be as fast as a standard spin cycle on a slot machine. MiniStar Roulette will feature a new ball-chasing light and sound package designed to elevate the player experience. LED lights on the wheel and amplifying sound effects will chase the ball until it drops into a pocket. Finally, the multi-game StarBar bar top allows players to interact with up to four games simultaneously including Craps, Multi-hand Blackjack, Roulette, Video Poker and more. At the show, the StarBar will demonstrate its ability to connect to external generators on Interblock’s booth. Interblock® is a worldwide leading developer and supplier of luxury electronic table gaming products. Its multi-player gaming devices set industry standards and provide the ultimate in luxury interactive entertainment experiences. The Interblock brand is globally recognized for diamond quality gaming solutions and technical support in more than 200 jurisdictions. 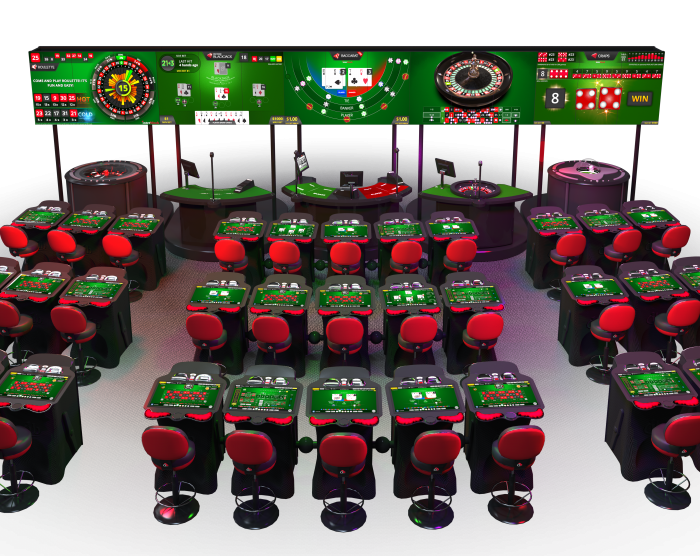 Interblock’s exclusive collection of fully and semi-automated electronic gaming tables and video gaming solutions provide casinos, arcades and gambling halls with superior product performance and their guests with an unforgettable gaming experience. For more information, visit www.interblockgaming.com or call 702-260-1384.